The great fire of Tenmei 8 (1788) reduced most of Kyoto to ashes. 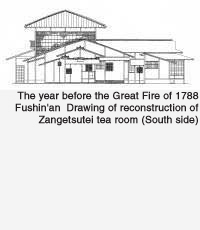 The Senke building was also destroyed, but there are several old drawings of it that have been handed down at the Iemoto and a sketch remains by Horinouchi Fushikisai (1780-1854), a tea devotee who learned chanoyu from the 8th Iemoto Sottakusai, was employed by the 9th Iemoto Ryoryosai and was an adviser to the 10th Iemoto Kyukosai, who became Iemoto at an early age. Looking at these drawings, it can be seen that there has been little change in Fushin'an, Zangetsutei and the roji (tea garden) area since the time of Koshin. Fushin'an was next to the Zangetsutei on its south side and the roji was built to the south of this. Near Fushin'an a dry moat faced the southeast and to the west of this there was a long stone extending to the south which was joined to the stepping stones from the nijiriguchi (crawl-through entrance). At the north end of the dry moat there was a atone wash basin for washing the hands. This wash basin had been in the Juraku residence and is now in the dry moat in front of the Sodo (Founder's Hall). On the east side of the south-facing garden there was a setchin (lavatory) and further to the south there was the sotoroji (outer garden). Coming out of Fushin'an's sadoguchi (host's entrance), there was a small mizuya (preparation room) immediately on the left. This led to the Zangetsutei, a tea room with a veranda. The room next to the Zangetsutei was an eight mat room and east of this was a three mat tea room and beyond this there was a room with an image of Buddha. The genkan (entrance) was on the west side of the eight mat room. To the north of this eight mat room was the residential area. Joshinsai built the Sodo (Founder's Hall) on the east side of the Zangetsutei. It was a thatched hut built on a foundation stone and the image of Rikyu was enshrined on an uncarved stone base.